You are considering whether to invest RM20,000 as down payment of a rental property. The difficult part of the decision is that you don't know whether the return of this RM20,000 is as good as your fixed deposits or unit trust funds. How to compare? You will need to know the Rate of Return of this investment in order to compare with your fixed deposit rate or your unit trust fund portfolio's rate of return. The tricky part of the comparison is that you cannot use return over the purchase price of the rental property as what you pay is not the purchase price but only the down payment. Neither can you use Cash on Cash return of investment, as Cash on Cash ignore the house ownership/ equity you acquire when you slowly pay off the bank loan. Your pay only the RM20,000 down payment and may be some initial legal fees and stamp duty, etc. So your actual investment is the RM20,000, upfront fees & expenses and, if any, net cash outflow through the years. Your return is the entire future value of the property after you have paid off all the property loan's instalments and, if any, the net cash inflow through the years. Yes, through the years...so it involves time value of money. You may download the Return of Investment calculator here. It is an Excel file, it may not work properly on browser. 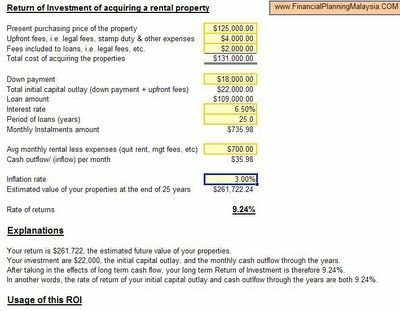 The biggest assumption of this calculator is the Future Estimated Value of your rental property. We must realise we can never accurately estimate future value of an asset. The calculator also assume that the loan interest rate is constant through out the loan period. This is rather unrealistic viewing current interest rate movement. However, these are the assumptions necessary to calculate the return of investment.